State College Lodge received its dispensation from Grand Master Doulgas Caudle last night, 17 June 2015. A crowd of more than 50 Masons from across North Carolina and Virginia arrived at McDaid’s Irish Pub shortly after 5:30 p.m. to dine together and celebrate the creation of the State’s newest lodge. Following the meal, the contingent of NC State alumni, friends, faculty, and staff–as well as a few Tar Heels and Blue Devils–climbed the narrow stair to the second floor above McDaid’s Tavern and into the office of the Hillsborough Street Community Service Corporation, which is generously letting their public meeting room to State College Lodge as a meeting hall. Despite a faulty thermostat (it was nearly 80 degrees) the meeting was opened in ample form by the Grand Master, who then called the roll of the officers and charged them with their respective duties. Past Grand Master Dalton Mayo served as Marshal and Senior Grand Warden Gene Cobb delivered the benediction. Following Grand Master Caudle’s charge to the officers and members, he presented the new Worshipful Master Michael Brantley a presentation gavel. Worshipful Master Brantley then asked Junior Warden Matthew Robbins to deliver an oration to the lodge, which detailed the strong ties between Freemasonry, the Grand Lodge, and North Carolina State University. As Robbins revealed, the Grand Lodge convened in their hall on Fayetteville Street on 22 August 1888, took possession of the cornerstone for the administration building–now Holladay Hall–at the train station, rode the train down to Pullen Road, placed the stone on a cart and then processed behind it to the site of the new campus of the North Carolina College of Agriculture and Mechanic Arts, now North Carolina State University. Following Robbins remarks, Worshipful Master Brantley explained the mission of the new lodge, via its relationship to the University as well as its duty as a lodge of Masons, was to convey ‘light’ to each other and to future generations. The conveyance of ‘light,’ or knowledge, is the hallmark of our civilization and the spread of well-cultivated ideas and knowledge will make the world a better place for ourselves, each other, and all mankind. Chris Chrzanowski, Secretary of The Patriot Lodge No. 1957 at George Mason University in Virginia, then generously presented an altar Bible to the new lodge and spoke about the importance of Freemasonry’s relationship to higher education and the good experiences The Patriot Lodge at GMU has had with the university community there. He kindly expressed his confidence in State College Lodge and wished the lodge well in its endeavors. Worshipful Master Brantley then proceeded to close the lodge and, after much applause, the members and visitors adjourned downstairs for refreshments. 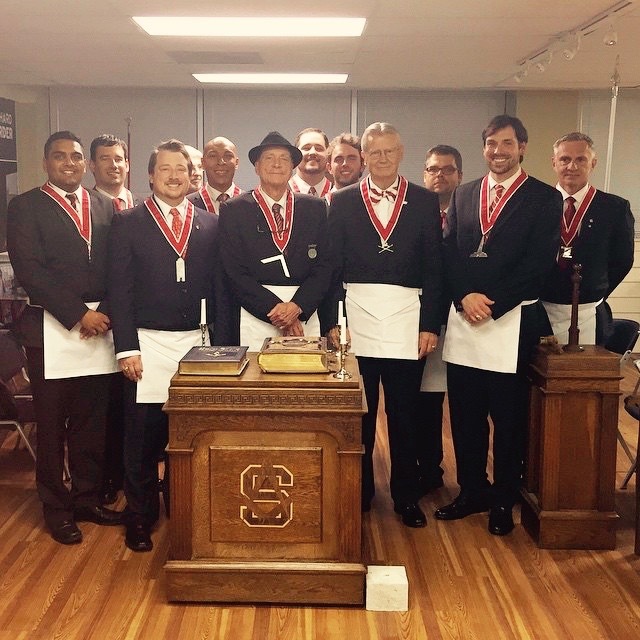 State College Lodge will meet on the 3rd Wednesday of the month. Its next meeting is scheduled for 7:30 p.m. on 15 July. Dinner at McDaid’s will begin about 6:15 p.m.